Hanging paper lanterns can instantly make a room look more elegant and lovely. They create a beautiful image that can immediately transport people to another place and time. From a historical perspective, paper lanterns first originated in China, during the Tang Dynasty. At that time, monks would use lanterns on the first lunar month to help them demonstrate their worship of Buddha. Others took up the practice and made hanging lanterns to symbolize and celebrate their peaceful lives. There have been many different types of lanterns (including star lanterns, palace lanterns, and gauze lanterns), but they all had the same goal: to impress and inspire all who saw them. Lanterns often took hours of delicate craftsmanship, grace, and artfulness to create beautiful designs and patterns. Careful thought went into designing them in different shapes (including octagonal, hexagonal, or even diametric designs). Today, history and art have combined to make lanterns popular in several countries. 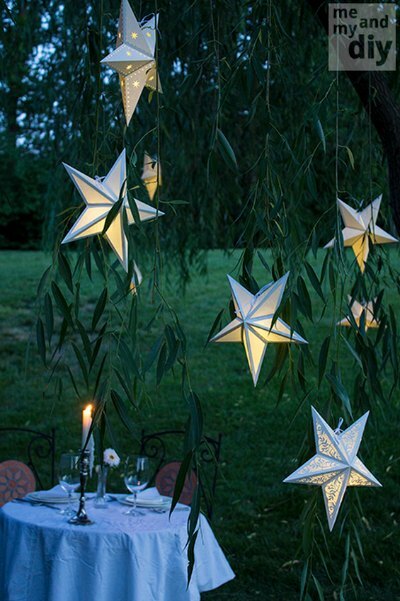 Paper lanterns can instantly create ambiance, especially star-shaped lanterns. With a little design and transformation you can instantly add style, flair, and incandescence to any occasion or atmosphere. All you will need to create your own paper star lanterns is a paper star silhouette and the patience to assemble the star and add your own designs to make it unique. Fortunately, we’ve tracked down a detailed and extremely helpful tutorial that will walk you through the process (with an excellent template that you can download) and provide you with the basic steps you’ll need to be able to branch out on your own. All you will have to do is start practicing your origami. Don’t worry, you won’t have to be a spacial genius to design your own 3D star art for your paper star lanterns. Once you get started it’s easy to discover how to make the specific folds you’ll need to design your lanterns. Plus, you can use any type of paper, colors, and designs or shapes that you want! All it takes is patience, a little design plan, and some thread or string.